I could tell I was walking into an innovation lab even before I saw the space, because I could hear the ping pong game underway as I stepped off the elevator. 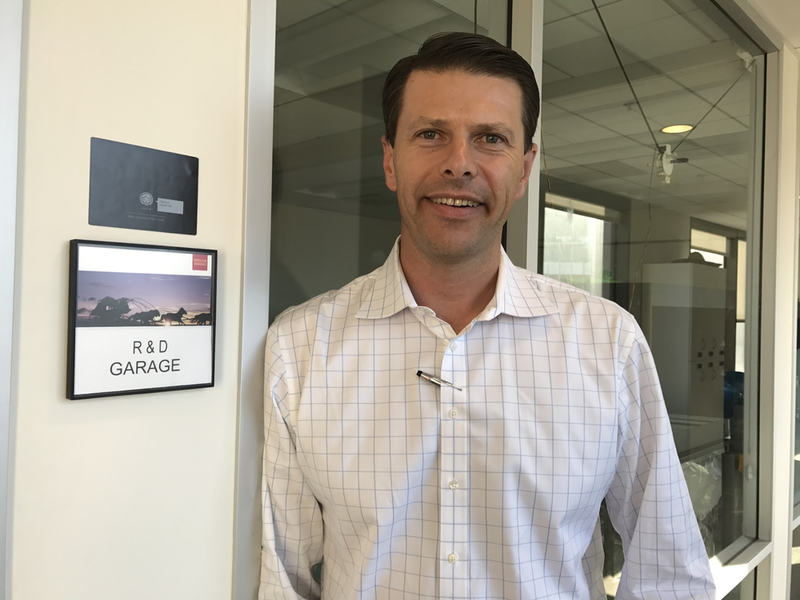 It was great fun to be in San Francisco, on a sunny day in early fall, to talk with Braden More, Wells Fargo’s head of partnerships and industry relations -- and to see their fascinating innovation facility, which includes what they call their R&D Garage. As Braden explains in our talk, Wells Fargo has reorganized to establish an integrated digital strategy for payments, under the leadership of their famous innovation head, Steve Ellis -- whom Braden described as the Steve Jobs of banking. They know that today’s customers expect a great digital experience, which means they won’t put up with processes that break down as they hit the old silo walls between traditional bank product groups, nor processes that merely automate old paper based, linear designs. Banking has to become fully digitized -- with all the gains in speed, cost, accuracy, and innovation that comes with digitizing anything. However, all the big banks know they do have to change, and also that they have to speed up -- dramatically. That’s because the technology change is speeding up. Its curve is exponential, which means that both the opportunities and risks are outstripping organizational models and cultures that were hard-wired many years ago -- even decades or centuries ago -- for linear change. A big bank innovation model is now emerging. It usually has a few elements. There’s an innovation team, which is usually small, is charged with rapid learning. Some of it is typically walled off, so that the big organization won’t accidentally smother it. There’s a lab-type effort, with a mandate to reach beyond short term, practical applications and do some dreaming. These sometimes have an actual playful edge to them -- hence the popularity of ping pong tables and bean bag chairs. Meanwhile, other parts of big banks today are busy with projects trying to smash down some silo walls and push people into the same rooms, to work knee-to-knee on shared challenges. And there’s usually an accelerator or incubator that brings in startups and tries to learn from them, sometimes making venture investments. Wells Fargo has all this underway, and Braden explains their philosophy on how to get the best of both worlds -- both isolating ninja-style disruptors while also making innovation central to everyone’s job. If you’re a fintech, he describes their accelerator and some of its successes, including Eye-verify, which verifies customers’ identity by scanning the whites of their eyes with a phone camera, and which has been acquired by China’s huge payments innovator, Ant Financial -- Alibaba. He also tells the story of Wells Fargo incorporating Zelle’s instant payment service into the bank, and its importance to customers who need quick cash. Our conversation ranges widely, from the future of fast payments and crypto-currency to the evolution of skills needed at banks. Braden also previews coming attractions for 2018. One key: he says active online and mobile users connect with the bank every 42 hours on average -- vastly more often than traditional branch customers. Converting this rich relationship into more value for both customer and bank is a key to the future. Big banks have unique challenges in embracing innovation, but they also unique resources for solving them. A highlight of my visit was seeing the toy room. Pepper is there -- the charming talking robot. So are 3-D printers, biometric safes, and drones -- Braden gives an example of how bank can use a drone. He even talked, intriguingly, of occasionally seeing the folks in The Garage busy making things with soldering irons. You hardly ever used to see that, in a bank office. Braden More is the head of payment strategy at Wells Fargo. He and his team work across Wells Fargo to coordinate payment strategy, incubate new initiatives, and represent Wells Fargo in the payments industry. Braden also serves as the portfolio manager for the Wells Fargo Startup Accelerator, a program that mentors and invests in innovative companies. Before assuming his current role, Braden was the head of strategy and planning for Wells Fargo Treasury Management. Previously he was with Wells Fargo’s Internet Services Group, and before that held positions in public accounting, management consulting, venture capital, and competitive strategy with Deloitte, Wit Capital, and Intel. Braden lives in San Francisco, where he is active as an advocate for experiential science education. He has served on the board of directors for the Exploratorium Lab and Marin Academy. His Twitter handle is @BradenMore. I’m about to finish what I’ve called my World Tour -- travels all over the world this fall making speeches, meeting fascinating people and, happily, collecting podcasts. I’ve learned so much, so fast, about fintech and regtech, it’s hard to absorb it all. I’ll be sharing lots of thinking in the new year. The upcoming podcasts are amazing. We’ll have one with Nick Cook, who leads the FCA’s innovation work on regtech, recorded at Regtech Enable in Washington. We’ll have Nerd Wallet CEO Tim Chen, and Cross River Bank CEO Gilles Gade. We’ll have one in London with the charismatic CEO of Starling Bank, Anne Boden and one with Innovate Finance CEO Charlotte Crosswell. We’ll also have a lively discussion with a group of amazing innovators working in Europe and Africa. We’ll have one with Michael Wiegand, who heads the Gates Foundation’s work on financial services for the poor. And back in the U.S., we’ll have a show with Financial Services Roundtable CEO Tim Pawlenty...to name a few! The 2018 schedule is filling up fast. I’ll share those events next time. I want to thank you for all your wonderful support this year, and I wish you a peaceful and joyous holiday season to you and yours!